The deadline to convert an Australian Shepherd to a Miniature American Shepherd has been extended from May 2014 to December 31, 2014. The deadline to outcross to an Australian Shepherd has been extended from May 2014 to December 31, 2014. Litters must be whelped on or before December 31, 2014 and registered with MASCUSA/NAMASCUSA on or before February 1, 2015. The minutes from our last meeting with AKC and USASA on July 7, 2011 are listed below for our members to read. Please note that an earlier draft of the minutes was mistakenly posted. The final approved minutes, now appear below. Changes and corrections from the earlier draft are noted in this set of minutes. Within these meeting minutes from our meeting on July 7th, you will read the agreements that ALL Entities have negotiated and agreed upon. We are very pleased with the progress that has been made for the future of our dogs. Every Friday, the NAMASCUSA office will send batches of vetted enrollment applications to the FSS department for process. Any enrollment application submitted to NAMASCUSA after the post mark date of July 31st, will have an FSS/AKC enrollment fee of $15.00 per process. NAMASCUSA needs to figure out what fee it will charge for the service of vetting dogs before they may be accepted by the FSS department. Any dog wishing to enroll straight into the FSS/AKC may do so as long as it has a certified NAMASCUSA pedigree. The fee to enroll your dog right into FSS/AKC is $35.00 per dog. The NAMASCUSA registry office shall serve as an office to vet pedigrees for dogs wanting to enroll into the FSS/AKC. The NAMASCUSA registry office shall serve as a registry for any foreign registered dog that wishes to have qualified dogs that can enroll into the FSS/AKC. This service will continue until each foreign country recognizes the Miniature American Shepherd. AKC shall continue to work with foreign registries towards recognition in those countries. The NAMASCUSA registry office will continue to register any dog according to our registry rules. See our registry rules for details. 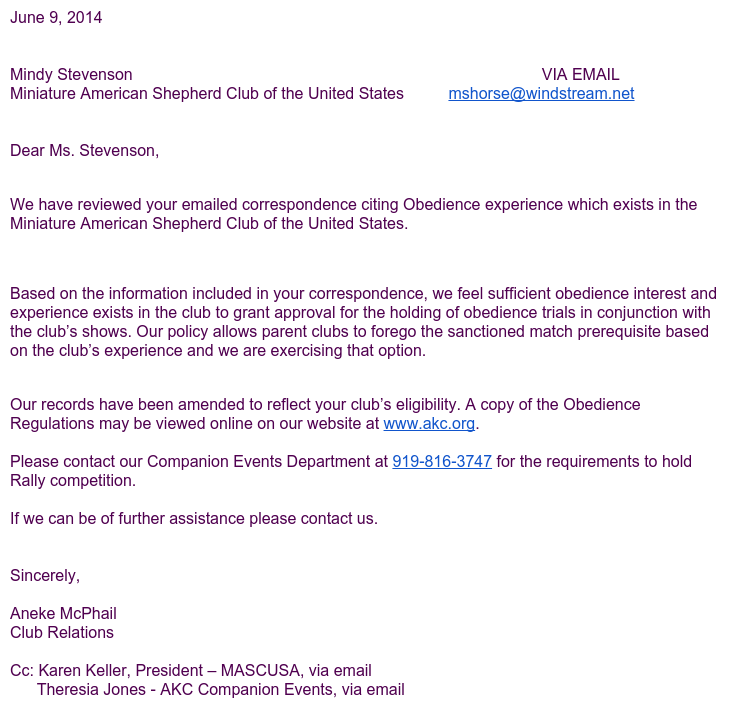 The NAMASCUSA registry office will continue to register dual registered dogs as well as hardship dogs. All resulting offspring are eligible for full recognition in AKC as a Miniature American Shepherd until May 9, 2014. You may do so by filing out the appropriate enrollment application and submitting it with the individual puppy application or with a copy of the NAMASCUSA registration as a result of that cross. On May 10, 2014, any cross that produces offspring with an AKC and/or ASCA Australian Shepherd within the first three generation may enroll into the FSS, but will not be eligible for full recognition. It may participate in a breeding program, it may participate in performance events as well as companion events. Once offspring is bred three generations clear of AKC and/or ASCA Australian Shepherds, it will be eligible for full recognition status. The MASCUSA stud books shall stay open. A program will be designed to allow for an open stud book for Miniature American Shepherds. For now, we will reference this program as the tiered enrollment/registration program. 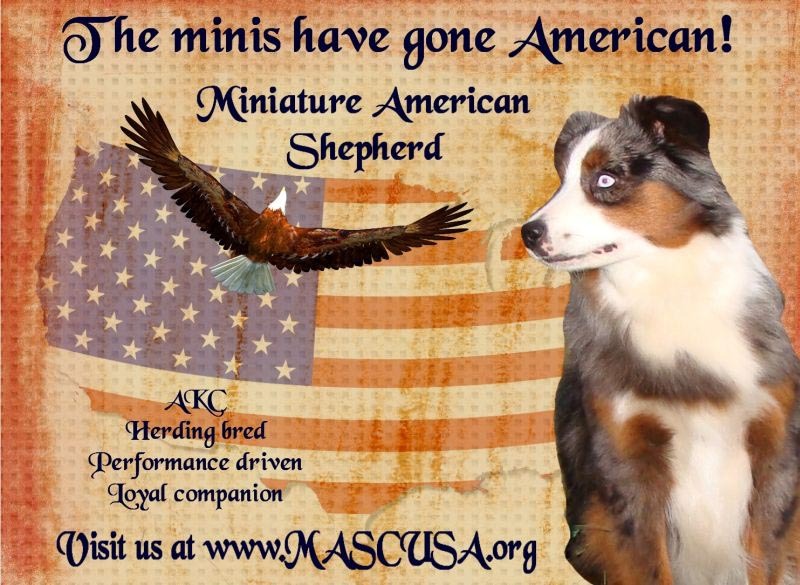 MASCUSA is the parent club for the Miniature American Shepherd in AKC. MASCUSA is responsible to inform show venues of who we are and request that the Miniature American Shepherd be added to the list of approved breeds. MASCUSA is responsible for requesting the addition of our breed to agility venues, herding venues, flyball organizations, health databases. MASCUSA will educate our members and affiliates of the importance to support breed acceptance in the AKC. MASCUSA will continue with education and participation with and about our Miniature American Shepherds. As the AKC parent club, MASCUSA will determine what registries the Miniature American Shepherd stud books will accept. MASCUSA will get a revised breed standard out to its membership for an official vote. This breed standard shall serve as the official AKC breed standard for the Miniature American Shepherd. The board of MASCUSA will send a draft of this BS to Mari-Beth prior to sending it out to the membership of MASCUSA for an official vote. MASCUSA will support our registry office as a vetting service and registry until which time AKC and MASCUSA mutually agree that AKC will take over all responsibilities of registering the Miniature American Shepherd. It is with great pleasure that we inform our respective memberships that the AKC Board of Directors, at its May meeting, approved the creation of the Miniature American Shepherd and designated the Miniature American Shepherd Club of the USA (MASCUSA) to be the parent club for this breed. The official notification is reproduced below in its entirety. This announcement is the culmination of years of hard work by AKC staff, in particular Mari-Beth O'Neill, the Boards of USASA and NAMASCUSA, and special committees appointed to assist in the effort. No less important to the process were the USASA and NAMASCUSA members who paid such close attention to developments along the way and who ultimately voted overwhelmingly to approve this outcome. The AKC Board of Directors has approved the request submitted by the United States Australian Shepherd Association to open the stud book of the AKC Australian Shepherd to voluntarily re-home dogs to create a new breed to be known as the Miniature American Shepherd. 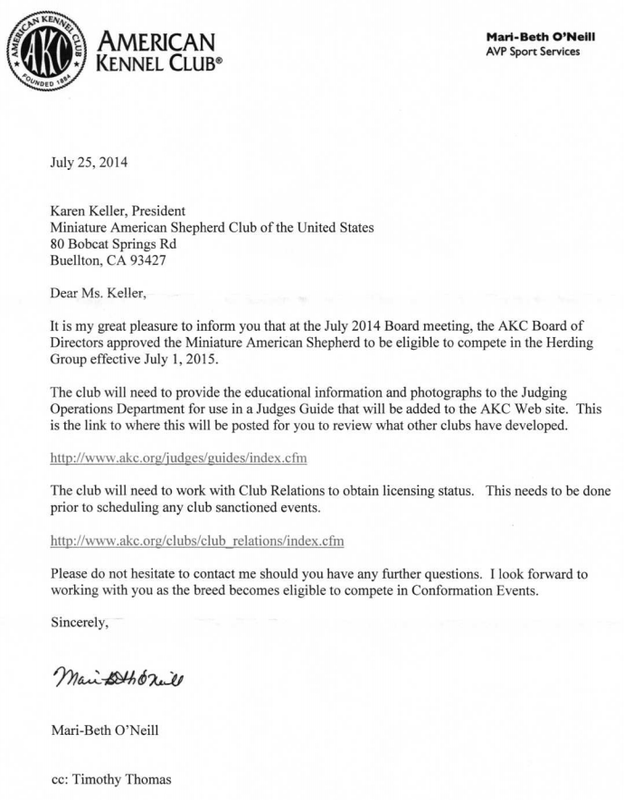 The AKC Board additionally approved the designation of the club formerly known as the North American Miniature Australian Shepherd Club of the United States of America (NAMASCUSA), to be the Parent Club for the Miniature American Shepherd. The name of the designated club will be changed to the Miniature American Shepherd Club of the United States of America, (MASCUSA). Dogs currently registered with the Parent Club and other registries as specified by the Parent Club will also be eligible for enrollment in the AKC Foundation Stock Service®. Staff would like to thank everyone who has worked towards this positive conclusion. Staff will be working with both organizations to develop a system to report the dogs that are voluntarily re-homed to establish the new breed in the AKC Foundation Stock Service®. After researching for almost 4 years and giving the membership the decision to decide the future of this club, the official results from the two notaries that certified the results of the NAMASCUSA membership vote are given below. NAMASCUSA has always been a member driven club. NAMASCUSA has always been inclusive, not exclusive. We will continue with those ideals as we move forward. The name of this new breed is the Miniature American Shepherd. The board of NAMASCUSA will be sending another letter to the membership this next week and will be inviting you to participate in our future. If you have questions, please contact the board. Survey for the purpose of selecting name finalists to be voted on. The USASA vote is in, below you will find Sharon Fontanini's message to the USASA membership regarding the results of their recent vote. As I take office it is my great privilege and pleasure to report that 84% of the members who voted have approved the USASA Proposal for Breed Division and New Breed Creation. Secretary Linda Grant reports that 881 members were eligible to vote. I would just like to add that from December of 2008 when the work towards this proposal began, to the present, the USASA Board has communicated consistently and thoroughly to you, using the Newsletter, Special Bulletins, Board Meeting Minutes, the USASA website, FaceBook, and other means. It is clear from the overwhelming support for this proposal that this communications effort was successful. I want to thank all of you for taking the time to follow on this complicated issue, which is so important to us all. The proposal will now be sent back to the AKC Board for final review and authorization. Once that happens, it will be up to the NAMASCUSA membership to approve the proposal, which would clear the way for NAMASCUSA to be the parent club for the new breed and help manage its entry into AKC. If the NAMASCUSA membership does not approve the proposal, then USASA and AKC have back-up options. This vote of the USASA members has made it a virtual certainty that the MAS will now be a new AKC breed and the controversies surrounding this breed will now begin to end. Going forward, I have asked Vice President Stevens Parr to follow on the work he began by continuing to represent the club on this project. This is a historic and exciting time for the club. We will be active in the creation of a new breed. Our Nationals will be moving indoors at the new Purina Event Center, building on a relationship with Purina that has been very good for the club. Overcoming many obstacles, Sharon Parr and Paula McDermid have brought the new website project close to completion, so the club will soon have a brand new and improved presence on the internet. Our member club program has taken root and should expand and mature. Our many contributions to the improved health and genetics of the breed continue. And there is much, much more. I am gratified and honored that you have selected me as President during a time that is so important to the club and the breed. 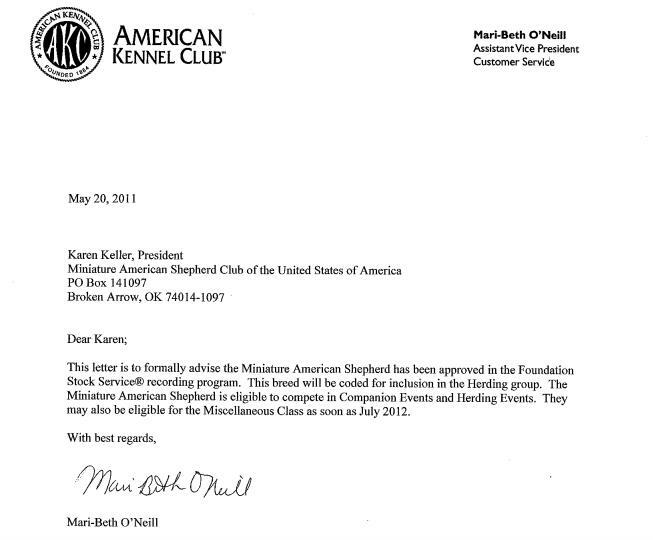 Below is the United States Australian Shepherd Association (USASA) announcement of the AKC Board's approval of its "Proposal for Breed Division and New Breed." The complete text of the proposal is also provided. Both documents were reviewed by the NAMASCUSA Board, its AKC Committee, and AKC staff to confirm accuracy and agreement on all sides. If the USASA membership supports the proposal, the first step will be taken towards AKC recognition of our dogs, which we are referring to here as "MAS". Assuming the USASA member vote is positive, the second step will be a final AKC Board review, hopefully clearing the way for implementation. At that point, you will be asked to vote on the proposal. 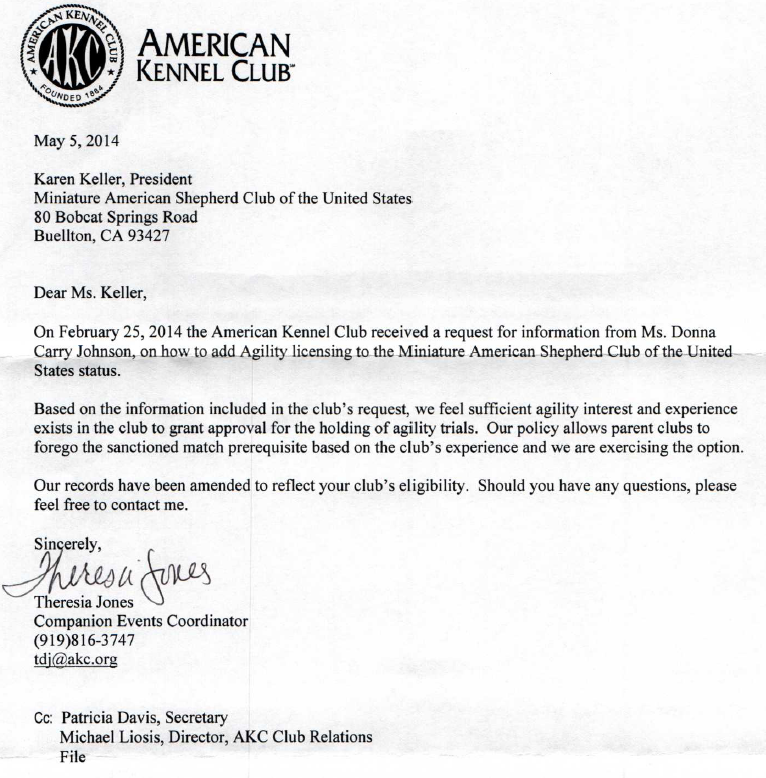 If you approve, NAMASCUSA Members, your club will be the parent club taking the new breed in to AKC! 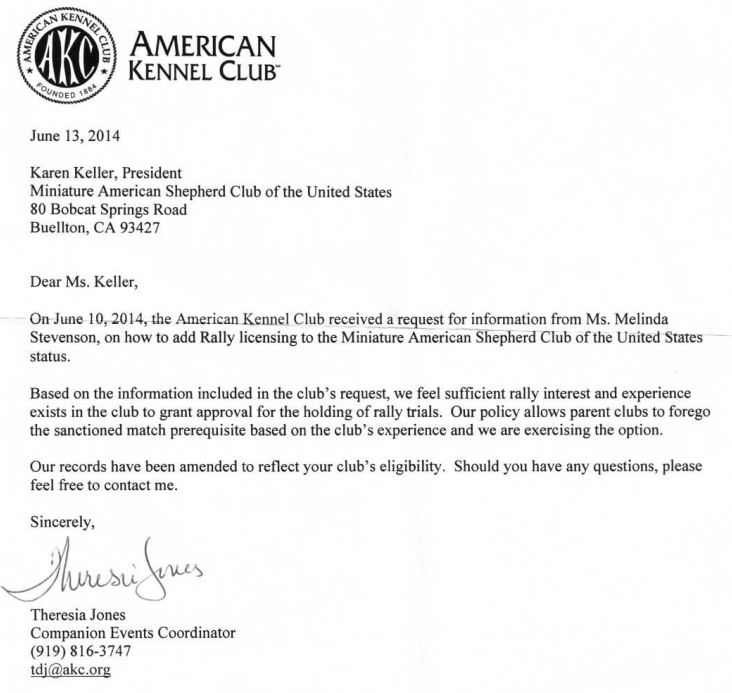 Last summer USASA and AKC approached our Board about joining in talks leading to possible AKC recognition of MAS as a breed. USASA was there because it is the parent club for the Australian Shepherd. AKC does not make decisions directly concerning a breed without parent club involvement, so USASA was critical to the process. Indeed, without USASA, this initiative could not have started. MAS could not be a variety or a size division of the Australian Shepherd, but must be a separate breed. The new breed must have a name that is not linked to the Australian Shepherd in any way. Bringing this new breed into AKC must include a sure and fair way of cementing a gene pool that no longer includes Australian Shepherds. A sure and fair way must be found to properly "rehome" any MAS that are currently in the Australian Shepherd stud book. There should be a solution to the problem of MAS being represented in the ILP/PAL program as Australian Shepherds. The Board was not happy with these pre-conditions. 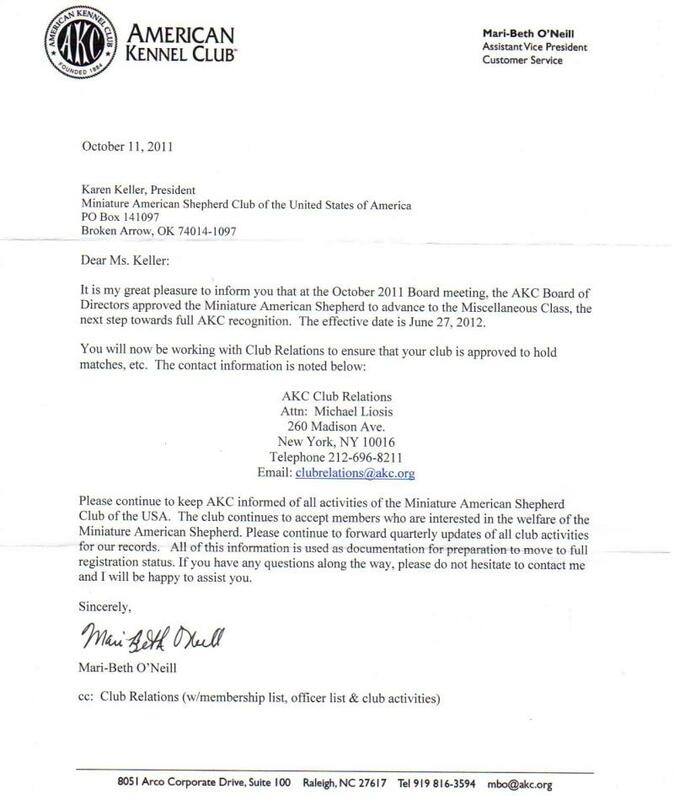 Yet it was clear that if these pre-conditions were not accepted, NAMASCUSA would have no influence on AKC recognition of MAS and, furthermore, another organization or group would be invited to take its place. This was communicated to the NAMASCUSA membership in a lengthy series of "Q & A's" prepared jointly by this Board, USASA, and AKC staff. Last September, you voted 218 - 108 to allow the talks to go forward. For a long time, the focus of the talks was how to expedite passage of MAS through AKC's Foundation Stock Service (FSS) the normal home for "developing breeds" before they achieve recognition. Going this route potentially meant many of our dogs would have to be bred and registered for three generations within FSS before recognition would be possible! That was unacceptable. The breakthrough came this summer when the USASA Stud Book Committee reported its finding that as much as 15% of the Australian Shepherd stud book consisted of MAS. At the same time it became evident that in spite of being bred from different foundation dogs and according to different breed standards, MAS and Australian Shepherds had become so intertwined genetically that they clearly had to be acknowledged as belonging to the same family. This meant that USASA could apply to the AKC Board for breed division, separating MAS and Australian Shepherd into two breeds. Simultaneously, USASA could propose that NAMASCUSA registered dogs should be accepted into the new breed, thus solving the problem of the FSS three generation requirement. That is what USASA has done and the AKC Board has approved. The proposal is not everything that NAMASCUSA could have desired, but it is history making in terms of how much it does do for MAS and the fancy. We will be on an unprecedented fast track to AKC recognition if you vote to accept this proposal! Remember, if you do not accept this proposal, then USASA and AKC will move to implement it with another organization or group, leaving NAMASCUSA without any influence in this process. We are not including a summary of the main points of the proposal, because this is thoroughly done in the USASA announcement, plus the full text of the proposal is also available to you here. NAMASCUSA will be providing further communications to answer questions that will inevitably arise. The NAMASCUSA Board and its AKC Committee will also be regularly available to answer questions directly. There will be plenty of time for this, because the proposal must first be voted on by the USASA membership. Then, if that vote is affirmative, it goes back to the AKC Board for final review and authorization. Only after that will you be voting. We look forward to a continuing dialogue with you as we go forward. Download the proposal approved by the AKC Board.